Heat the oven to 200°C/180°C fan/gas 6. Toss the rhubarb in a roasting tin with the 200g sugar, orange zest and juice and cardamom to coat. Roast for 10-15 minutes until tender. Cool, then put in a serving bowl, cover and chill until needed. For the crème caramels, combine 150g of the sugar with 100ml cold water in a pan and heat gently until the sugar dissolves. Keep on a medium heat until it turns into a deep brown caramel, taking care not to burn it – watch it like a hawk. When ready, quickly pour the caramel evenly among the ramekins, tilting them to coat the bases and sides evenly. Put aside to cool and set. Reduce the oven temperature to 140°C/120°C fan/gas 1. In a bowl, whisk together the orange blossom water, milk, saffron (and its soaking milk) and cream. In a separate bowl, whisk together the whole eggs and yolks with the remaining 75g sugar. Slowly pour the cream mixture over the eggs, whisking all the time. Put the ramekins in a roasting tin, then pour the custard mixture evenly among them, on top of the caramel. Fill the tin with enough hot water to come halfway up the sides of the ramekins. Bake for 1 hour, then remove from the roasting tin and leave to cool completely. Chill for an hour to firm up before serving. When ready to serve, run a knife around the inside of each ramekin and invert onto a plate. Serve with the rhubarb. Freeze egg whites in a food bag marked with the date/quantity for up to 3 months. 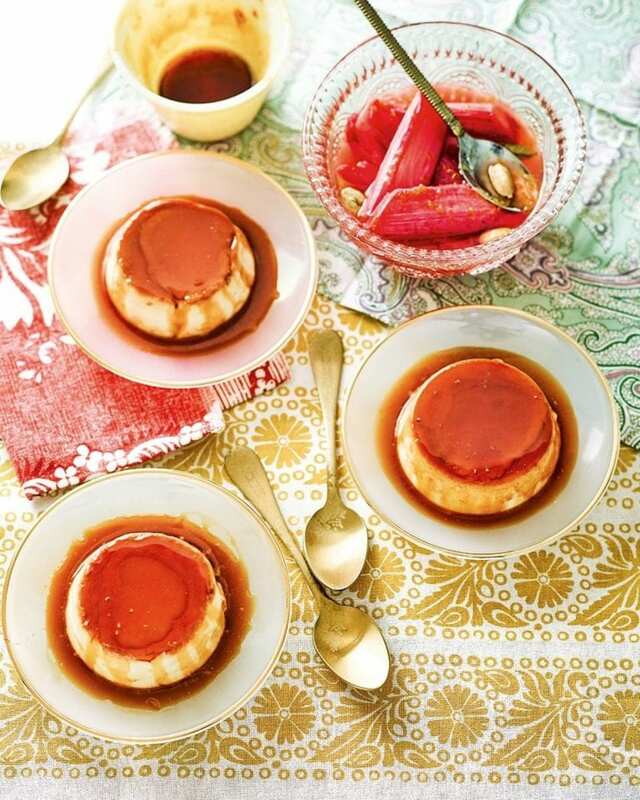 Make the caramels and rhubarb a day ahead, then cover and chill separately.